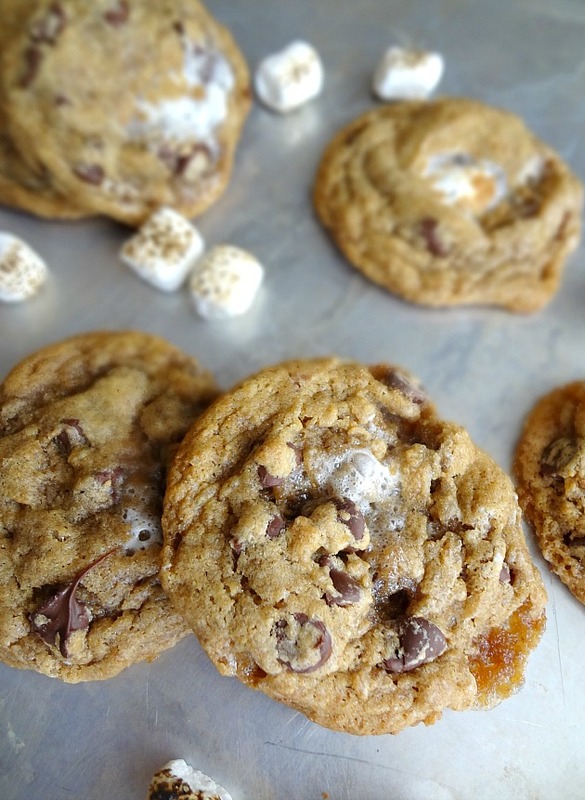 As we know...I've made S'mores Cookies before. 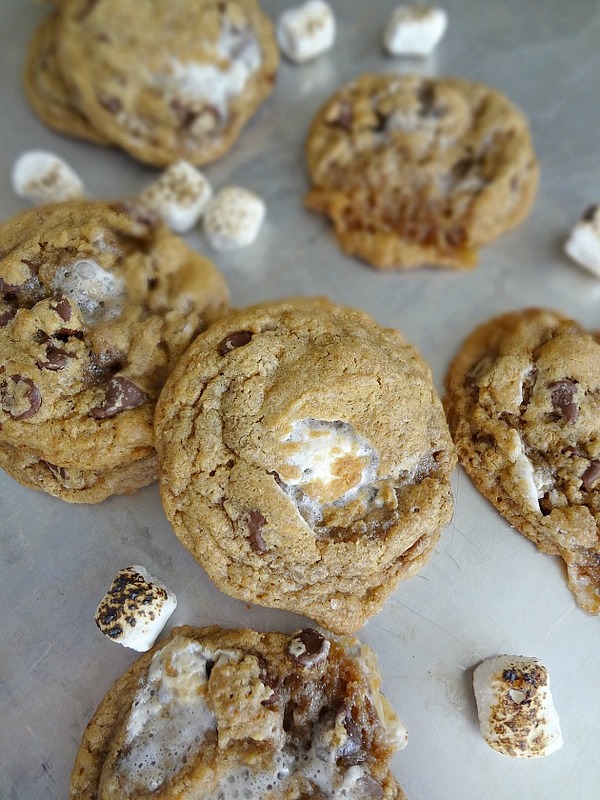 I made those Chocolate Insomnia Copycat Cookies not that long ago, and awhile back I even stuffed some s'mores inside of cookies. But Michael asked me to make some cookies for him to bring to work, and for some reason he suggested I make s'mores cookies. So I decided to make a new version. I decided to keep it OG with these cookies. 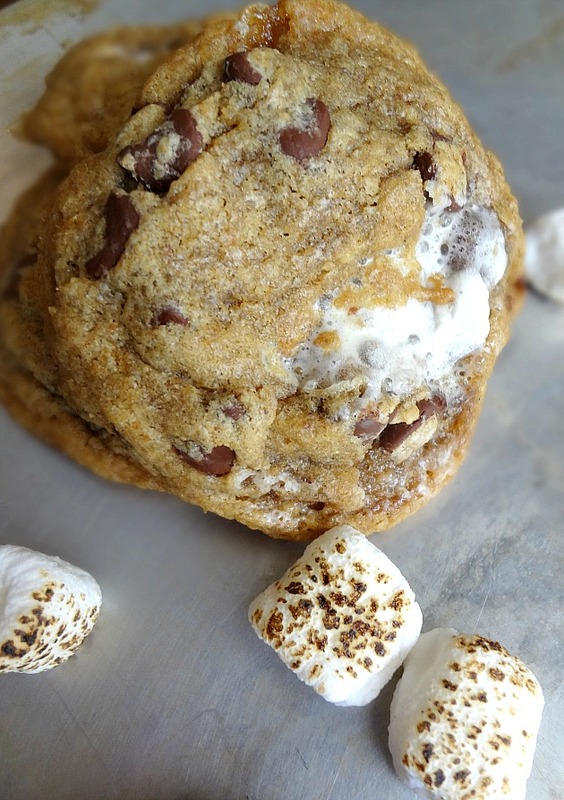 A chocolate chip cookie dough with a BUNCH of ground graham crackers in it is the base (and ohmygawwwd that dough is insanely delicious) and then there are chocolate chips and mini marshmallows to bring the trinity of summer desserts together! 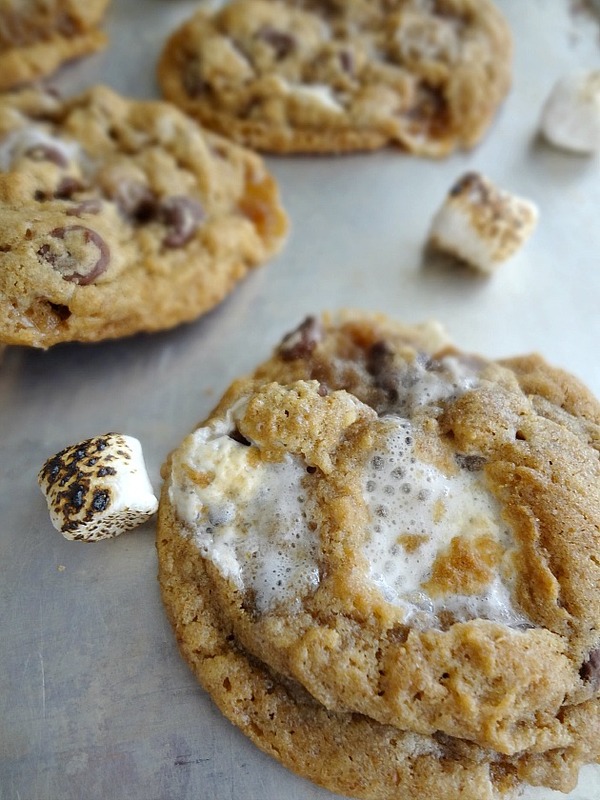 All the yumminess of a s'more...without quite so much of a mess. Or need for fire. I'm the messiest eater ever. And s'mores are messy to eat for anyone-so for me it's double the messiness. I usually have stuff smeared all over my face and need a wet napkin with me to aid in the clean up. These cookies don't require such up-keep. Also, Michael's coworkers love love loved them. Of course. And gobbled them up and told their significant other's that they needed to step up to my level. Make ahead tip: you can store dough overnight or for up to 72 hours prior to baking. You can also store baked cookies, in an airtight container, in the freezer for up to 3 months. Preheat oven to 350F degrees and line a large baking sheet with parchment paper. In the bowl of a stand mixer with the paddle attachment (or using a hand mixer) cream together the butter and brown sugar (scraping down the sides of the bowl as needed) for a couple minutes, until fluffy. Beat in the vanilla and egg until fully incorporated. Add the graham cracker crumbs, flour, baking soda, and salt and mix on low speed until just combined. Using a medium cookie scoop (about 1.5-2 tbsp, of dough), scoop out the cookies and space out with approx. 2 inches of space in between on the prepared baking sheet. Bake for about 10 minutes, until lightly golden and just set. Let cool on the baking sheet for about 10 minutes and then transfer to a wire rack to completely cool. Enjoy! Store leftover cookies in an airtight container at room temperature for up to 5 days.